The hammerhead shark is one the most astounding animals in the sea because of the distinctive but well-recognized shape of their head. In total, there are seven species of hammerhead sharks, but you won’t find them all in the Dutch Caribbean. 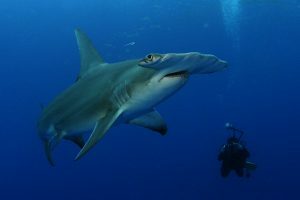 The largest member of the family, the great hammerhead (Sphyrna mokkaran) is occasionally sighted on the reefs and is considered one of the most remarkable encounters to have as a diver. But because of increasing fishing pressure and a very low reproductive output, it is estimated that globally, great hammerheads have declined by 80% in the last 25 years. 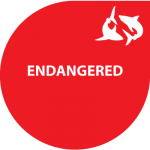 Therefore, it is now listed as an endangered species on the IUCN Red List. A question that most people ask when seeing a hammerhead shark is why they developed such a particular wide head shape. In addition to the advantage of having an increased amount of electric sensors on their snout, with which they can detect their prey, the shape appears to make it less strenuous to swim because it lessens the drag of the water. On top of that, scientists also found out that hammerheads usually swim slightly tilted to optimally reduce the water drag. In the Dutch Caribbean, it is unknown how hammerheads use the area, but it may just be a vagrant species as tracking studies from the United States demonstrated that great hammerheads are highly migratory species that undertake journeys of hundreds of miles. A recent study on great hammerhead sharks in Bimini showed that they can make large scale return migrations of a whopping 3030 km. The biology of great hammerheads is mostly an enigma, but we do know they can grow to as much as six meters, although a length of four meters is more common. You can find the species both close inshore over the reef, as well as migrating further offshore over deeper waters depending on their life stage and the time of year. It takes a young hammerhead shark many years to mature for reproduction, which doesn’t happen until they’re about 2,5 meters long. After that, females start giving birth one every two years to 6-42 pups growing in at 50-70 cm. The diet of hammerhead consists of shellfish, squid, and other fish, including southern stingrays. Hammerhead shark fins are relatively large and therefore highly valued on the Asian market as an ingredient for shark fin soup. To keep feeding this demand, hammerheads are increasingly targeted in some areas. Fortunately, this is not the case in the Dutch Caribbean. Research shows that about 5% of all shark fins on the Hong Kong market are hammerheads, including specimens from the Western Atlantic Ocean. Also, despite what their impressive size would suggest, hammerhead sharks are very prone to stress, which makes them highly vulnerable to even catch-and-release fishing practices. 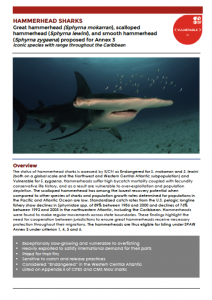 Thus illustrating the importance to protect hammerhead shark throughout the wider Caribbean region to ensure they will remain to patrol our islands as great guardians of the reef. The giant hammerhead shark is one of the eight shark species that are now officially protected under the international Specially Protected Areas and Wildlife (SPAW) Protocol, which is the only cross-border legislative instrument for nature conservation in the Wider Caribbean Region. This fact sheet with information about the species was produced to support the proposals for listing.